Canadian Architect editor Elsa Lam works at her treadmill desk at her home office. Last year, I got a jump on a New Year’s resolution. About four months ago, I bought a treadmill desk. Most of the text in the current issue—as well as the past few issues—was edited while walking on a treadmill. The principle of a treadmill desk is simple enough. Picture a regular treadmill, with the support arms removed and a horizontal desk surface in their place. 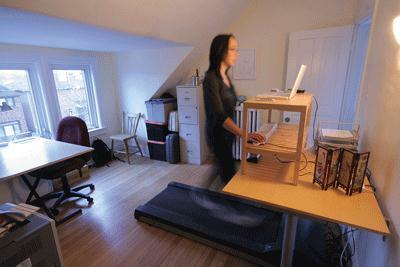 Instead of running, treadmill desk users walk at a speed between one and two miles an hour—slow enough that it doesn’t interfere with typing, reading and other desk work. To support this, the treadmill has a motor designed to run at low speeds for long periods of time. Some models, such as a line manufactured by Steelcase, are designed as stand-alone stations complete with wrap-around worksurfaces and monitor arms, while others—including the one I have—slide under an existing desk. The theory behind why this is a good way to work is also common sense. As humans, we’re evolutionarily adapted to be constantly on the move, foraging and moving camp. We’re not physically built for sedentary office life, necks craned towards a computer screen. Even for people who work out regularly, sitting a lot can be a health risk. Apart from the regular backaches and neck pains, studies have shown that sitting puts muscles into a kind of metabolic hibernation. The presence of good cholesterol and fat-busting enzymes in the body drops, which makes seated office workers more prone to cardiovascular problems and diabetes. Moving over the course of the day steadily burns calories and has been linked to a decreased risk of heart disease. In my personal experience, a treadmill desk has made me healthier without the drudgery of gym workouts. What’s more, just as long walks often prove the best times for thinking, walking while working keeps my mind clear and alert. The continuous flow of activity makes me less prone to distraction. The post-lunch energy dip, generally combatted with caffeine, almost entirely disappears from my day. Here’s the downside. While it’s great for my fitness, as a physical object, the treadmill desk is a beast. The model I have, by LifeSpan, is relatively bare-bones, and still, it weighs in at 120 pounds—heavy enough that in lugging it up the stairs, my husband and I pulled several muscles in a not-so-healthy way. It takes up enough floor area that we needed to rearrange our entire home-office layout to accommodate it. Our downstairs neighbour has complained about vibrations through the floorboards, so treadmill use is limited to daylight hours, and we’re keeping a vigilant eye for plaster cracks in the ceiling below. Will treadmill desks someday go mainstream? While I’d love to have one at the magazine’s headquarters, I can’t see it fitting in with the office’s layout, an open floorplate with modular workstations. I’d be two feet taller than my seated neighbours, on a machine making a whirring noise that they’d no doubt find disruptive. This is a design problem as much as it is a cultural issue. In the shift from drafting tables to computers, most architecture firms switched out metal stools for ergonomic chairs. Variable-height desks (easily converted from sitting to standing heights) are now starting to appear in some workplaces, and large rubber sitting balls in others. The shift to treadmill desks requires another leap—perhaps to a Google-style workplace where high activity, eccentric work styles and sneakers are the norm. Alternatively, treadmill desks themselves might be due for a redesign to more discreet models. A compact elliptical trainer hidden under a desk might not be as dramatic as a treadmill, but combining physical activity with the ideas economy is a trend that deserves to catch on.